Health and Hygiene education became an integral part of the programme as children needs to be mandatorily educated for better knowledge. 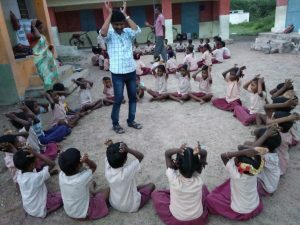 Classes were conducted in schools in the coastal villages of Villupuram District. 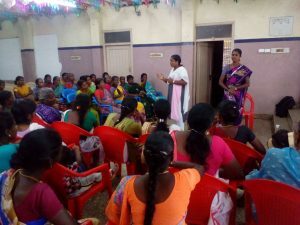 In the past two years we were able to reach out to one Panchayath Union Middle School and 10 Panchayat Union Primary Schools spread across 11 villages. A total of 1359 Government school children (671 boys & 688 girls) aged 6-15 years were trained in environmental and healthy water and sanitation practices. REAL did not stop with providing awareness on health and hygiene, but also improved the drinking water conditions in the schools with greatest need. Pipelines, overhead sintex tank and motors were mounted to provide clean drinking water to the school going children in the Panchayat Union Primary School in the villages of Mudhaliarkuppam, Kottakuppam, Chetti Nagar and Koonimedu. A total of 585 children studying in these four schools benefited from the programme. Potable water has long been an issue of serious concern to the coastal communities, even during the pre-tsunami period. The condition worsened after the tsunami as many of the wells and water resources became saline due to the inundation of sea water. Many measures have been taken to attempt resolution of this issue over the past two years. REAL has been influential in training the community to ensure potable water through a simple water testing kit ‘jaltara’. We have trained 166 community members and 19 children to use the kit to identify potable water sources in their village. This testing has now gained momentum as the staffs are also in the process of training all children who attend the child activity centres. Communities are now able to test the quality of drinking water and come with their complaints with the respective authorities if the contamination level is high. 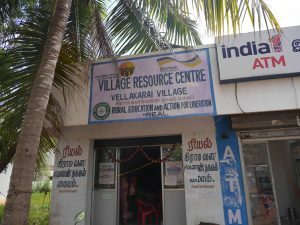 In Villupuram District, REAL has undertaken programmes for women and children in the tsunami affected coastal villages for water and sanitation, health and hygiene to increase the standard of living through Self help groups. This has been done at the community level and at the school level. Promoting cleanliness and safe sanitation practices at the schools was implemented to enable the younger generation to be better aware of water borne diseases and the benefits of clean and safe classrooms and toilets. We have been influential in the formation of School level WatSan Committees with the aim of creating leadership quality among the younger generation. Both girls and boys are the part of the three committees – Water committee, Sanitation committee and Hygiene committee – and take care of the maintenance and hygiene at their schools. Awareness creation is important, but necessary infrastructure is required to yield the desired results. 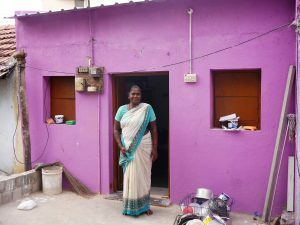 We have been tangential in constructing community toilets in the villages of Azhagankuppam, Kaipenikuppam, Vasavankuppam and Ekkiarkuppam. 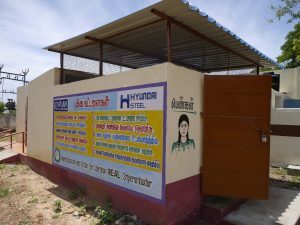 These are open toilets for public use maintained by the respective women’s groups of the village who collect minimal user fee for their maintenance. With regard to schools, our effort to construct s chool toilets at Anumanthaikuppam, Keezhputhupattu, Manjakuppam, Pudhukuppam and Marakkanam Schools has been fruitful with the support of DRDA- Villupuram and the respective Parent Teacher Associations. 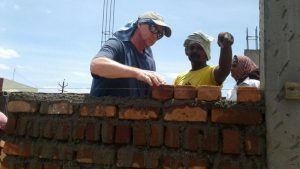 The toilets have been constructed and benefitted by the children. Promotion of kitchen garden is explained to the children and community by the use of waste water. Ecosan Toilets: In most of the second line villages, REAL has found that one of the main problems that the communities face in terms of health and sanitation, was the problem of human waste disposal. 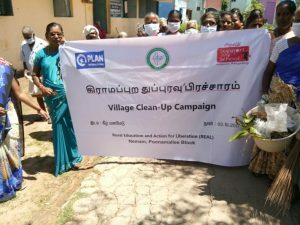 Most of the communities adhered to the practice of open defecation which lead to a series of health problems and caused uneasiness among the women, especially the adolescent girls who felt insecure and prone to abuse at times. This led REAL to promote Ecosan toilets among the village population in order to set up a hygienic system of human waste disposal, to retrieve and reuse the nutrients from human waste, economize in water use, and above all, provide a sense of security and hygiene to women and adolescent girls. 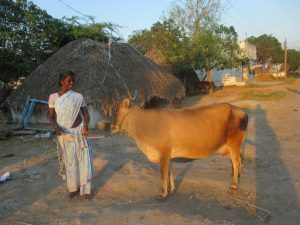 REAL chose the villages of Chinnamudaliar Chavadykuppam (CMC Kuppam) and Nadukuppam to promote the concept of Ecosan. Awareness progra mmes were initiated among the community members and also among the children on the benefits of Ecosan toilets. The 100 Ecosan toilets were constructed in the two villages and the families are responding positively in adapting such toilets as it involves less water usage, and also provides a medium of income generation in the long run as agricultural manure. We have also created sanitation awareness in the community through street theatre campaigns, exhibitions, puppet shows etc. 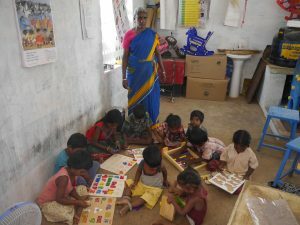 Training to children has been increased by insisting on school hygiene education. REAL helped the rural oppressed people by providing low cost material for the production of pipe, slab and pan by the creation of “Rural Sanitary Mart” in turn to generate income to the people. REAL has always focused on the vulnerable sections of the society, especially the children, women, adolescent girls and the disabled. The future of any nation depends on the health condition of its people. Every year, free eye and medical camps have been conducted in the target villages. Education is provided in our target communities about the common health problems that affect these families. The communities have started using the existing health facilities and taken advantage of Government immunization schemes. Through our networking we have motivated the local primary health care staff to visit the villages to render necessary care for the children and pregnant mothers. Our recent initiative is to promote kitchen gardens at homes and at the ICDS centres, through the SHGs and children clubs. This is showing good results as the local level nutrition needs are now being met free of cost. The most familiar topics that were discussed on the Health Education Programmes like – Personal hygiene, Hygiene practices after defecation, Cleanliness with regard to teeth, Unprotected edible items and spread of disease, Safeguard through wearing foot wear, Diarrheal problems, causes and prevention, – Usage of ORS (Oral Rehydration Salt), Utilization of PHC (Primary Health Centre), Water-borne diseases and prevention, Mother and child health, Reproductive health, Nutrition, Immunization, Waterborne diseases, Childhood disability, Drinking water supply & Prevention of HIV/AIDS/STD etc. In partnership with the Tamil Nadu Health Care Services project, REAL has initiated a 24hr ambulance health care project. The ambulance provides services to the needy communities in around 55 village panchayats in the Marakanam block.